Chopping and splitting wood are skills that are dying a slow death. Just ask a few millennials if they know how to use a wood axe and they will respond in the affirmative. And that roar in laughter as they try. But keep an eye open as one of them might succeed in chopping off their leg. Ok, enough ranting. On a serious note though, wielding a wood axe is a skill everyone should learn. You never know when you may need it. But beginner or pro, when it comes to getting a wood axe, you need the best. And that’s why we’ll be looking at 5 of the best wood axe brands you can trust to put a good axe in your hands. When it comes to getting the best wood axe for your specific needs, you need to determine what the main purpose of the axe is. Is it chopping wood or splitting? Is there even a difference? Yes, there is. Do let’s investigate them. A wood chopping axe is mainly used for felling trees and breaking them down into more manageable chunks. Because of this, the axe has to have a light and sharp axe head. This allows for deeper and more precise cuts. The shaft is also longer so as to give you a mechanical advantage, that is to say, it allows you to apply more force to the tree. After you have chopped your wood, you’ll have to split it into pieces you can use to make a fire. For this, you need a heavier and duller axe head. The shaft will also be shorter than that of the chopping axe. These qualities make for an axe that doesn’t need as much effort on your part. The heavy dull axe head does most of the work. Hopefully, those little nuggets have shed some light on what kind of wood axe you should get. But who should you trust to equip you with one that is satisfactory in terms of performance, reliability, and durability? Well, that’s what we are here for today. Let me point you in the direction of 5 wood axe brands you can trust with all your chopping and splitting needs. Ready? Then let’s get to it. When it comes to wood axes not all of them are the same, and neither are the companies that supply them. Here are the 5 wood axe brands you should trust. These are brands that supply, not just sharp edges, but ergonomic handles as well. Husqvarna is one of the oldest tool and equipment company in the world. Founded IN 1689 Sweden, the company features tools and equipment in every industry vertical from domestic appliances and power tools, to construction and mining equipment to everything in between, they have products there. What does that have to do with your wood axe? Well, everything. Because of such a rich history, they have mastered the art and science of making tools that serve extremely well, including the humble wood axe. When it comes to wood axes, two of their best sellers are the Husqvarna 26" Wooden Multi-Purpose Axe and the Husqvarna S2800 27" Composite Splitting Axe. The former is more of a multi-purpose tool but it is a very excellent chopper. Especially for campers and others who love spending time in the outdoors, you’ll find this versatile axe a great addition to your tools. The S2800 is a powerful splitting axe designed to help you split large logs and chunks of woods effortlessly (almost) and efficiently. It comes with a composite fiberglass handle that helps dampen vibrations and a heavy axe head with a hammer function for splitting wedges. Husqvarna is one of the world’s best wood axe brands, with their axes and rated 4.5 stars out of 5. You probably know Fiskars from their orange-handled scissors and other office supplies. But when it comes to a weekend getaway, Fiskars also does an excellent job of equipping you with some pretty awesome axes. Fiskars is a Finnish company that was founded in 1649 in the village of Fiskars at the behest of Christina, the then Queen of Sweden. No, she didn’t want a special wood axe. She commissioned Peter Thorwöste to build a blast furnace and a forge for the purpose of producing nails, wire, hoes, and metal-reinforced wheels. The Fiskars 28-inch chopping axe is a terribly beautiful chopping axe that makes short work of felling trees, thanks to its unique axe head that has a special grind that affords deeper and cleaner cuts. The design of the entire axe gives it an improved power to weight ratio that gives you increased swing speeds that result in more power. Aesthetically, the black and yellow colors compliment the design very well, making the axe look majestic and rugged at the same time. This 5 out of 5 stars rated is such a great axe. 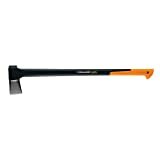 The Fiskars X27 Super Splitting Axe, as the name suggests is a super axe – it’s awesome. It’s designed to offer exceptional balance and maximum power so as to help you split a log in one deft move. In all honesty, this 4.7 out of 5 stars rated is one of the best axes you can get for yourself. Gransfors Bruks was established in the village of Gransfors, Sweden in 1906 and has just over 110 years of craftsmanship under its belt. Although it’s a small company with just over 32 members of staff, they make superb handcrafted axes. Each axe comes with the smith’s signature as a guarantee of quality. The Gransfors Bruks Outdoor Axe is an exceptionally sculpted axe. In fact, it’s reminiscent of an RPG game or a Viking movie. With a 1lb tempered steel axe head and a beautiful 14.75-inch hickory handle, this axe feels natural, well-balanced, and easy to use. It also comes with a beautiful leather sheath replete with steel studs to protect the blade when in storage. But this 4.5 out of 5 stars rated wood axe is definitely worth it. This is a great multitasking wood axe you won’t regret investing in. The only downside is that such quality craftsmanship comes at a cost. Founded in Portland, Oregon in 1939 by Joseph Gerber, Gerber Legendary Blades is a company that specializes in outdoor tools. And they make exceptionally great knives. Oh yes, and gorgeous wood axes. But don’t get it wrong, they don’t just make axes that look good, they make some pretty darn effective ones too. In fact, once you try a Gerber wood axe, you just might not turn to any other axe. One of the best Gerber wood axes you should strongly consider as you look for a wood axe is the Gerber 23.5-Inch Axe. Featuring a forged steel head that has excellent edge retention and a composite handle that absorbs shocks well, this is one axe you can use for prolonged times without you quickly succumbing to fatigue. This 4 out of 5 stars rated is an excellent specimen. Another American wood axe brand you should definitely give a shot is Estwing. Founded in Rockford, Illinois by Swedish immigrant Ernest Estwing in 1923, Estwing is a powerhouse when it comes to designing axes that are both pretty and powerful – making for some pretty powerful axes. For campers and backpackers, the Estwing Fireside Friend Splitting Axe is definitely an axe you want to take with you into the woods. Featuring an all-metal construction, you are assured of a wood axe that you will hand down to generations after you. The nylon grip is also comfortable and absorbs vibrations well, giving you. The Fireside Friend is a compact axe that has enough power to handle wood splitting extremely well. When it comes to dealing with larger logs, the maul on the reverse side is pretty effective in driving wedges. 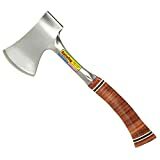 You definitely can’t go wrong with this 5 out of 5 stars rated wood axe. Whether you are the outdoor type or not, a wood axe should be a part of your possessions. This is a versatile tool that can come in handy in situations you may never imagine. And with most of them coming at affordable prices, there’s no reason not to have one. So which wood axe brand resonated the most with you? Go ahead and pick one?